Thunderbolt capture and playback in HDMI and analog. Intensity Shuttle is now available with incredibly fast Thunderbolt technology. 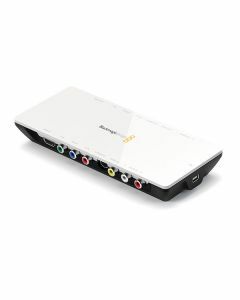 Capture and playback the highest quality SD and HD video in full 10-bit quality, with HDMI, analog component, composite and S-Video connections. Intensity Shuttle’s innovative design is compact and portable, plus you can plug inline with your cables because input connections are on one side, and output connections on the other! Intensity Shuttle is powered over the Thunderbolt cable so you don’t need cumbersome power supplies. Intensity Shuttle uses the same high quality electronics as Blackmagic Design's high end capture and playback solutions. It’s easy to add the amazing quality of Intensity to your laptop, desktop or computer workstation! Intensity is available in a model that connects to computers using Thunderbolt technology with the fastest data transfer speeds. Now you can capture the highest uncompressed 1080HD video with portable devices that are powered from the computer connection! That's truly portable! Intensity Shuttle is perfect for portable use or moving quickly between computers. Available in two versions featuring either the latest fast Thunderbolt or USB 3.0 technology. Intensity Extreme is machined from a solid piece of aluminum and is both super tough and beautifully designed. Connects to your computer using fast Thunderbolt technology. Video files are fully compatible with popular editing and design software including Apple Final Cut Pro, Adobe Premiere Pro CC, Avid Media Composer, Photoshop CC and After Effects CC. Physical Installation: Requires a computer with Thunderbolt.